The “Network for a Hate Free Community” [site here] is an outgrowth of the County of Santa Clara, California, and headed by Delorme McKee-Stovall, who has taken up Scientology’s jihad against members of Anonymous and ex-Scientologists who regularly protest the nearby San Jose org. At the apparent behest of Scientology (most likely via Scientologist John Allender, who began a campaign: see here), McKee-Stovall recently republished a possibly libelous flier [page one, two] targeting the protesters after she met and threatened them with publication of the flier if their protests against Scientology continued (She reportedly told one of the protesters, “If you cancel your protest tomorrow, we will cancel our flier distribution.” [see here]). The protesters McKee-Stovall met with declined the offer. Obviously, this raises serious questions about the role of McKee-Stovall’s office and the County of Santa Clara in the potential defamation of its own citizens, and possibly even whether the protesters’ civil rights were violated. Initially, though, was the publication defamatory? Generally, a member of a group has no cause of action where the defamatory statement targets the group. See Debra T. Landis, Defamation of class or group as actionable by individual member, 52 A.L.R.4th 618 (2008). An exception to this rule exists where (a) “the group or class is so small that the matter can reasonably be understood to refer to the member”; and (b) “the circumstances of publication reasonably give rise to the conclusion that there is particular reference to the member.” Michigan United Conservation Clubs v. CBS News, 485 F. Supp. 893, 897 (W.D. Mich. 1980). As larger groups generally have no cause of action, the size of the group described by the flier is material, and here, open to some interpretation. The flier targets “members of a group wearing masks and calling themselves ‘Anonymous’ and disaffected members of the Church of Scientology,” On one hand, the group that refers to itself as Anonymous is large–indeed, worldwide. However, the particular group of protesters in Santa Clara County is far smaller–fewer than 25 people. As the flier is actually tageting two groups, “disaffected [ex-Scientologists],” it may be the case that one group is more qualified under the group exception than the other; here, I would suspect that the protesting ex-members are more identifiable than the members of Anonymous, particularly moreso than those Anonymous members who remain anonymous. One important aspect of defamation is that damages are keyed to others being exposed to the defamation; you cannot be damaged if no one knows you’ve been defamed. Moreover, the publisher of the flier, McKee-Stovall, met with particular members of the group targeted, even going so far as to threaten them with publication in exchange for the group’s promise to cease protesting [see account here]. 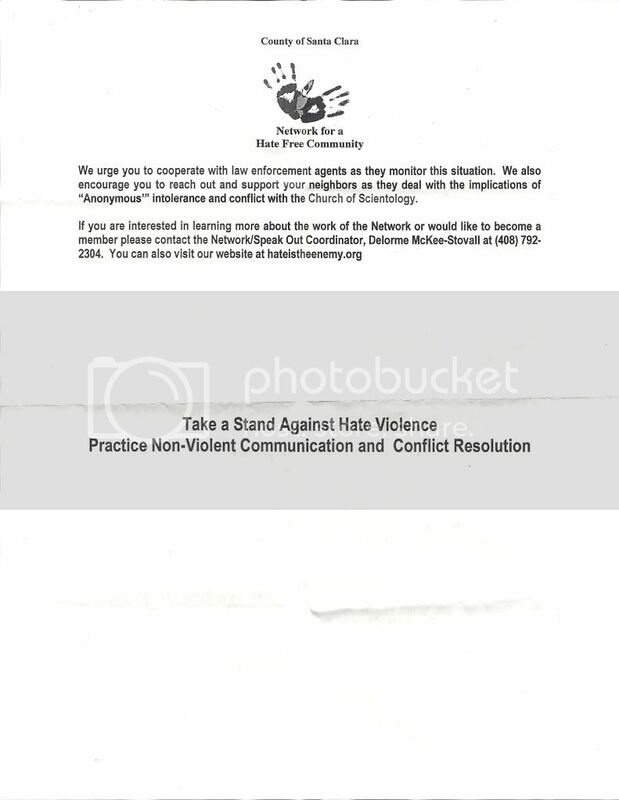 It would be difficult for McKee-Stovall to maintain that the flier did not target individual members since she threatened particular members of the group with its publication. The protesters routinely protested, and the County became aware of them by Scientology’s complaints–surely McKee-Stovall could not have thought she was negotiating with a group larger than one which she apparently believed could be controlled by the few members with whom she met. It would appear that the group targeted by the flier satisfies the exception to the general prohibition against group defamation causes of action. Assuming then that members of the group targeted by the flier could maintain a cause of action for defamation, the question becomes whether the flier is defamatory. There is no question that had the flier falsely accused a particular member of the group by name of committing any of the acts therein, that person would have a cause of action for defamation. The closer question is whether the information in the flier is false. The falsity requirement is problematic in that the flier appears to carefully avoid stating that any particular member of the group (with one exception) committed the itemized criminal acts. It does strongly imply, however, that the group members are responsible for these acts. Courts have recognized “implied libel,” one of them even involving Scientology. See Southern Air Transp., Inc. v. American Broadcasting Cos., 877 F.2d 1010, 1012 (D.C. Cir. 1989) (“The applicable law holds that a defamatory inference may be derived from a factually accurate news report.”); Church of Scientology v. Flynn, 744 F.2d 694, 696 (9th Cir. 1984) (“The arrangement and phrasing of apparently nonlibelous statements cannot hide the existence of a defamatory meaning”). Such instances are rare but seem particularly applicable here, as the language could easily be read as having been designed to circumvent defamation’s technical requirements; that is, the publisher of the flier wants the reader to believe that the protesters are responsible for the listed criminal acts, but wants to avoid the consequences for having done so. Indeed, there are few other plausible interpretations as to the intent of the flier’s publisher. If the flier, due to its technical lack of falsity, doesn’t lend itself to a cause of action for defamation, “false light” may be a better fit. Like defamation, it requires actual malice, its content must be “highly offensive,” but unlike defamation, need not be technically false–merely misleading. Most states recognize false light and California is no different, first acknowledging the tort in Gill v. Curtis Publ’g Co., 239 P.2d 630 (Cal. 1952), where it found that the Ladies Home Journal was liable where it included, in an article criticizing “love at first sight,” a photo of an unaware couple with a caption implying that they were engaged in an illicit affiar. As in the defamation analysis, if McKee had named particular persons, the question of false light would be easily resolved. However, because she targeted a group, the question arises: is there a false light ‘group exception’ analogue to the group exception in defamation? For the federal district court of Western Michigan, the answer was yes, although it ruled that the group before it was too large to bring a false light claim. The analysis, however, was the same: a group can maintain a false light claim if the group is so small that the publicity can be reasonably understood to refer to the plaintiff, and the circumstances surrounding the publicity give rise to the inference that the publication refers to the individual. See Michigan United Conservation Clubs v CBS News, 485 F.Supp. 893 (W.D. Mich, 1980). 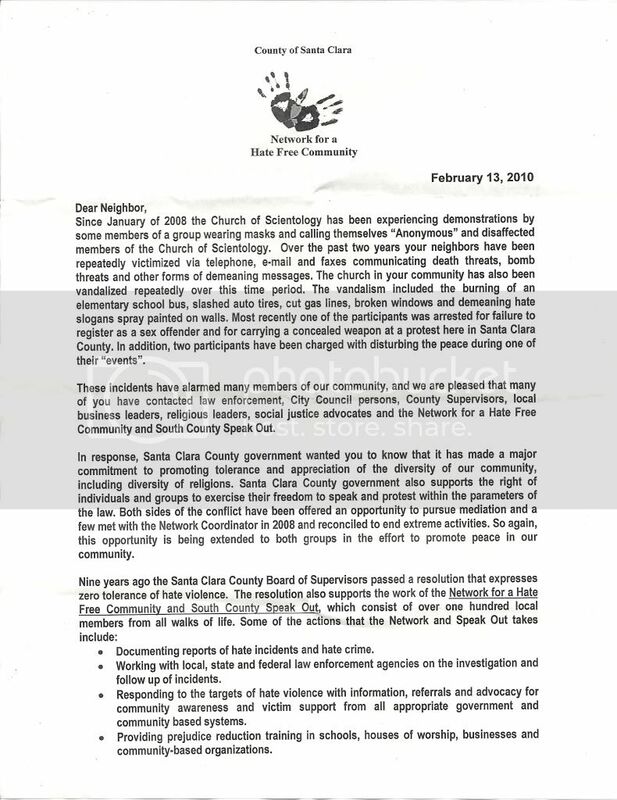 By ascribing heinous criminal acts to the Scientology protesters without knowledge of the allegations’ truth, McKee-Stovall recklessly communicated that criminality to the fliers’ audience–the neighbors of the protesters and citizens of Santa Clara. The group of protesters is small enough that it can be reasonably inferred that the flier targets those individuals. Protesters harmed by the publication of this flier have a valid cause of action for the tort of false light.